For about seven months, discussion on Chowhound has been fervent and enthusiastic about the “Giant Kimchi Buns” of Ming Chan Dong. After my trip in February, I put in my two cents, which led to bigjeff inviting me to join him and his friend annamatic for dinner last Thursday. I brought Salley, who came with me last time, and the four of us feasted on an obscene amount of food. These are the kind of encounters that make me really love the Internet. Kindred spirits meeting over plates of offal, lamb, and raw potato salad! 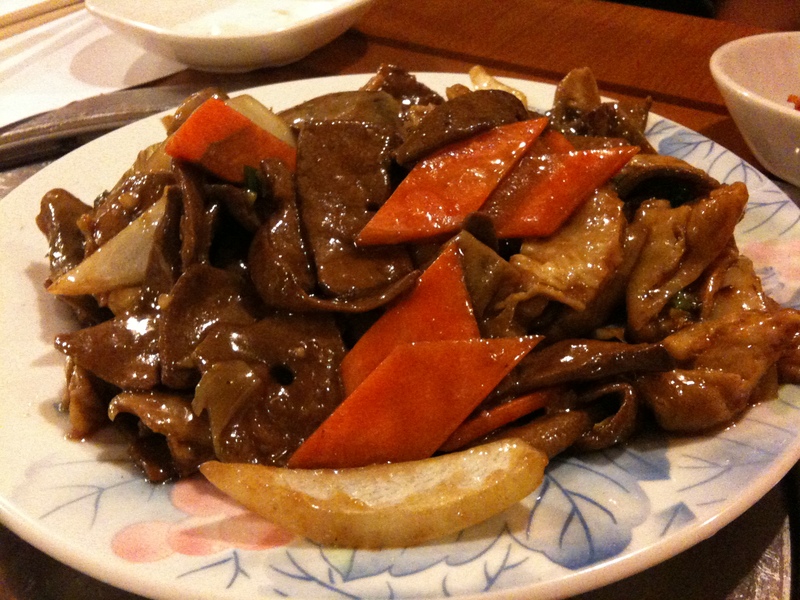 The Offal Three-Ways was just as bigjeff described it, homey and cooked to a nice tenderness. bigjeff was liberally salting it at the table, but I didn’t find it too bland. The “hai tu,” which looked like sauteed baby squid, was a waitress recommendation and something we couldn’t find on the menu. Simple, fresh, and nicely chewy. I love chewy. The lamb with cumin was truly “the bomb,” as the waitress claimed. Firm, spicy, the heady complexity of cumin. Totally un-Korean, as the only spice Koreans ever really use is cinnamon. We were also comped a wonderful rawalmost raw potato salad, spicy and sharp with vinegar. 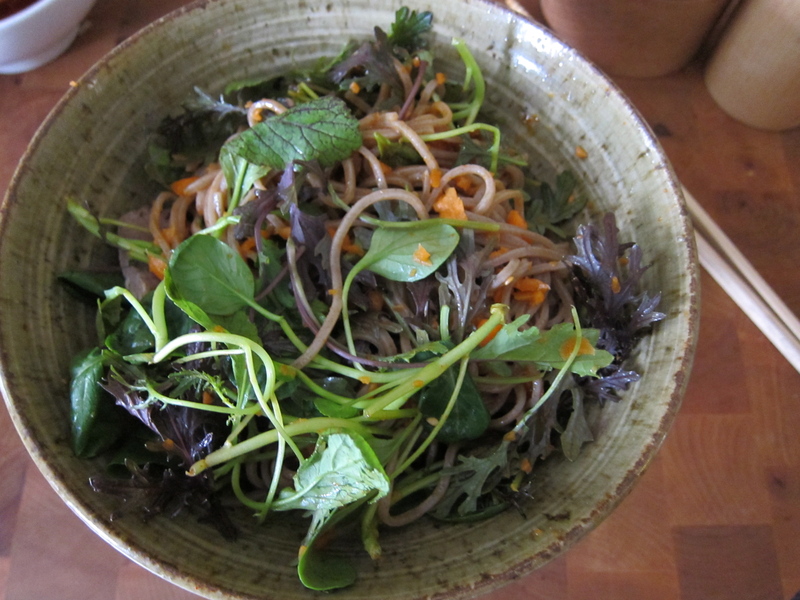 This felt a bit Korean, as it reminded me of classic muchim preparations for salad. The only Korean-ish dishes we ordered were two bowls of cold noodle soup or naengmyeon, one made out of arrowroot and one made out of corn. I probably liked the noodles more than anyone else. The broth was sweeter and more vinegary than I’m used to, but it was still refreshing, and the noodles had a good bite to them. The corn noodles mystified me. They were in the same broth as the chik noodles and served with all the classic Korean cold noodle accoutrements, but I have never, ever had or even heard of noodles made out of corn. Our waitress said their Korean customers are always surprised, and even in China, it is not a common dish. 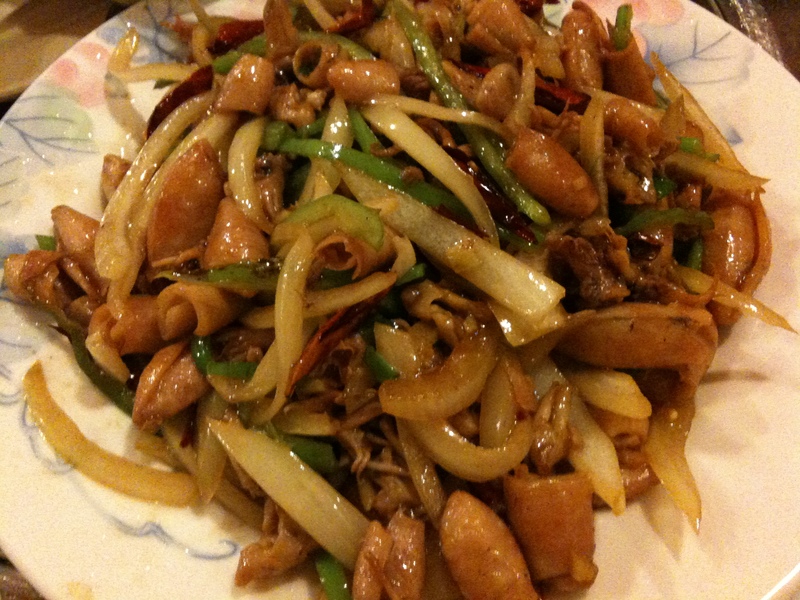 Rather, it’s unique to the particular part of Dongbei the restaurant represents. The Chinese on the menu called these noodle dishes “leng mian,” which is pretty similar to “naengmyeon” and very similar to the North Korean pronunciation, 랭면, or “leng myeon.” On some level, I’ve always known how much of the Korean language borrows from Chinese, but this dinner made it particularly clear. The best, I saved for last. 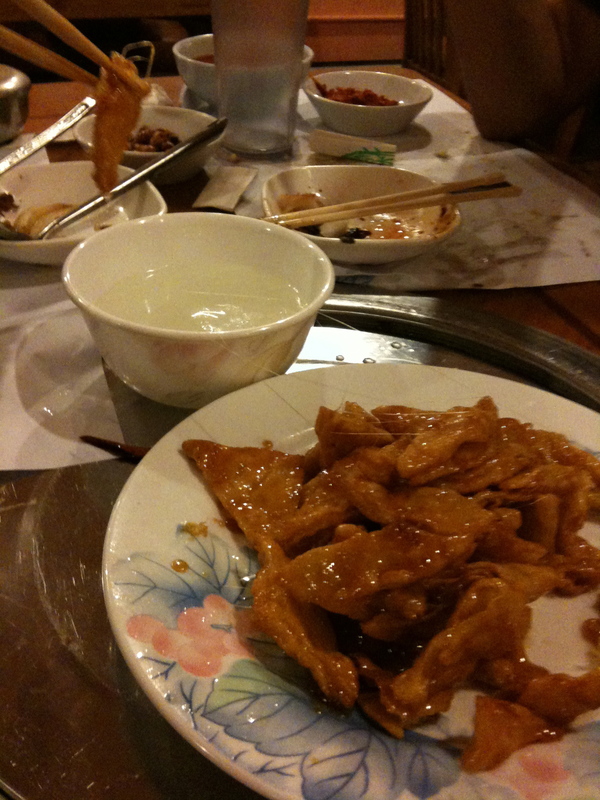 We wanted to get candied taro or sweet potato, which I’ve had in Korean-Chinese restaurants. Chunks of sweet potato are fried in a sweet glaze that gets rock-hard, almost hard enough to chip a tooth. According to bigjeff, the glaze gets hard when it gets dipped in cold water. I had never had the taro version, and we were all carefully saving room in our stomachs to eat a piece, when the waitress told us they had run out. We had already made up our minds to stop at another Chinese restaurant to eat it, when she came back and offered “ba si ji dan.” The Chinese speakers at our table were perplexed, as “ji dan” means “chicken egg,” and we couldn’t imagine how that could be glazed like taro/sweet potato. It turns out it is totally possible to candy-glaze fried eggs, and that it is absolutely delicious. It was served with bowls of cold water. As we pulled the pieces off the plate, threads of sugar followed, but as soon as we dipped the pieces in the water, the glaze turned instantly crunchy and crisp. Inside, the egg remained tender. I felt almost a tinge of sadness sitting there and wondering if this would be the only time in my life I would ever eat this particular dish. Are eggs ever cooked this way? Would any other restaurant serve it? Would even this restaurant ever serve it if it had taro and sweet potato on hand? I realize I have very good philosophical problems. I seem to have lost my groove, maybe even lost the taste of my hands. I had a bad experience with jellyfish two Sundays ago. I stupidly fried chicken in a sweltering hot kitchen. And this past Sunday, when I hosted a barbecue at my friends’ place, nothing worked quite right. I’d picked a classic Korean barbecue menu: galbi or flanken-cut short ribs with plenty of greens, seafood-green onion pancakes, and mul-naengmyeon, or cold noodles in an even colder beef broth. Should have been easy, should have been fun. Instead, the pancakes were slightly flabby. The ribs were fine, the way all charcoal-grilled meat is fine, but they weren’t great. I’m not sure if it was the quality of the meat, the marinade, or the amount of time they spent in the marinade. And then the naengmyeon. Oh the naengmyeon. Naengmyeon in Korea is like pizza. Completely ubiquitous, but almost no one makes it at home. If they do, they buy the dried noodles complete with a little silver pouch full of “seasoning,” inevitably loaded with MSG. Kind of like the pizza in the supermarket freezer case. 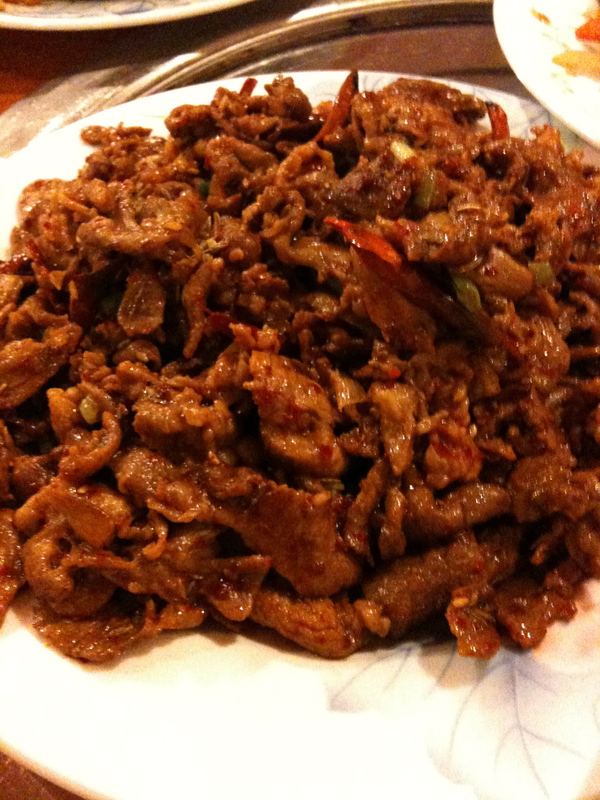 It’s also as popular as pizza, a cheap, delicious meal, especially in the monsoon days of Korean summer. No one I know can say whether they like mul-naengmyeon, cold noodles in broth, better than bibim-naengmyeon, cold noodles in a sharp, bright spicy sauce. Everyone likes both. 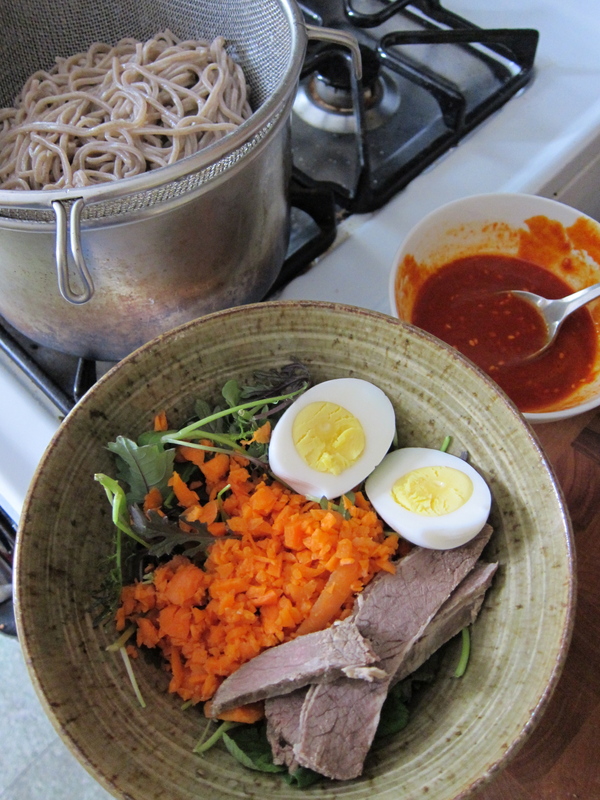 Both dishes play on the Korean preference for the tang of vinegar-spiked foods, cut with a good but not overt amount of sugar, with mul-naengmyeon taking on the sinus-clearing flavor of Asian mustard, heavy on the horseradish. And whatever the noodles are made of, sweet potato or buckwheat or arrowroot, they’re intensely chewy to the point they’re almost impossible to break just with your teeth. In a naengmyeon shop, everybody will be hanging their heads over their bowls with noodles dangling out of their mouths. 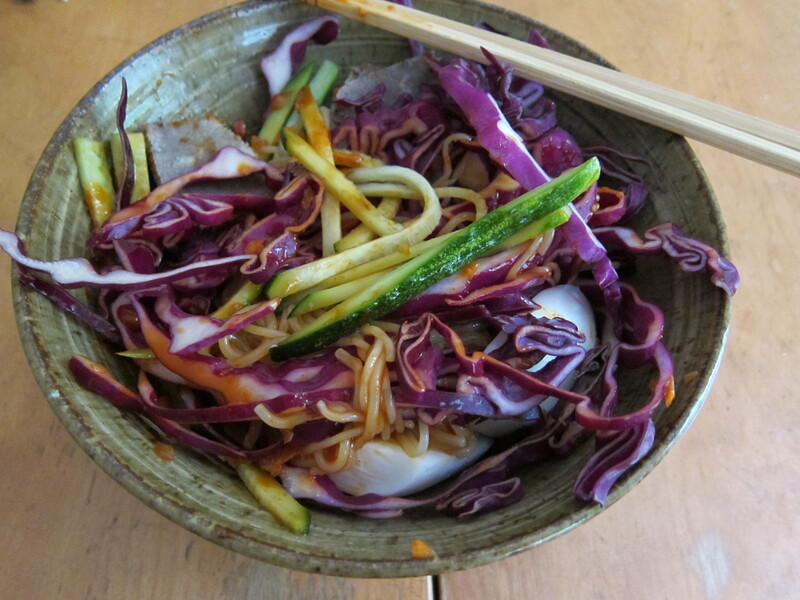 I think it’s why many non-Koreans are often befuddled by naengmyeon. Chewiness is not a virtue for many Westerners, and noodles made out of buckwheat have a pallor that would be off-putting to a lot of Americans. No matter though, that just leaves more naengmyeon for the rest of us! 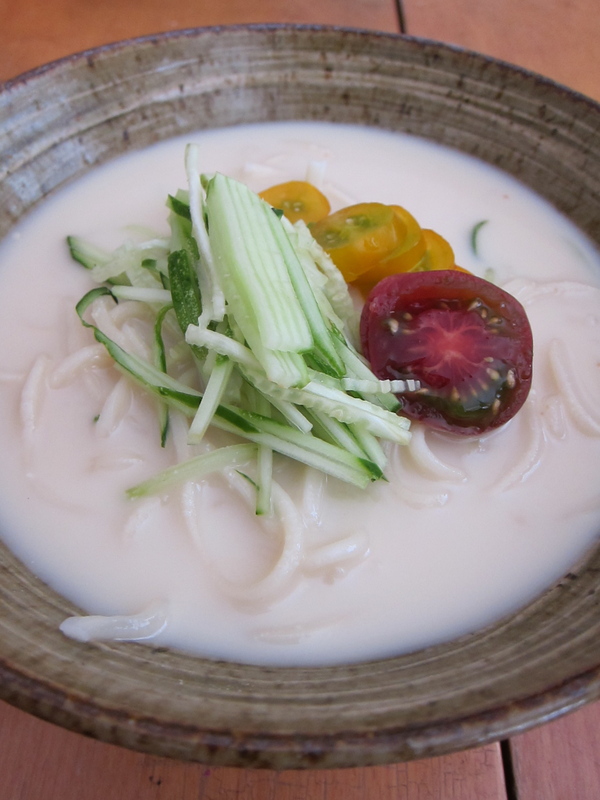 But craving naengmyeon in New York is hard. There are no good dedicated naengmyeon shops in Manhattan, and every time I order a bowl, it’s more in memory of the more exemplary versions I’ve had. The good news is that despite the naengmyeon mess I made during dinner on Sunday, I have found over the course of experimentation that it’s not so hard to make something that tastes at least as good as what you’ll find on 32nd Street. With some more work, I think I could make something even better. The recipe still needs tweaking, but there are clear-cut lessons I’ve learned. 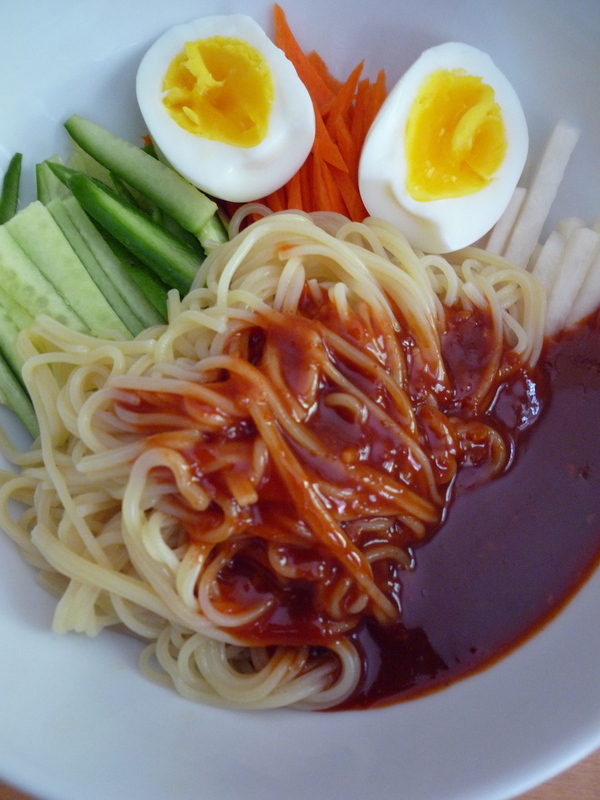 1) Avoid cooking naengmyeon for more than 4 people, max. It’s actually best as a solo or two-person lunch. Make it for yourself and someone who loves it and deserves it. 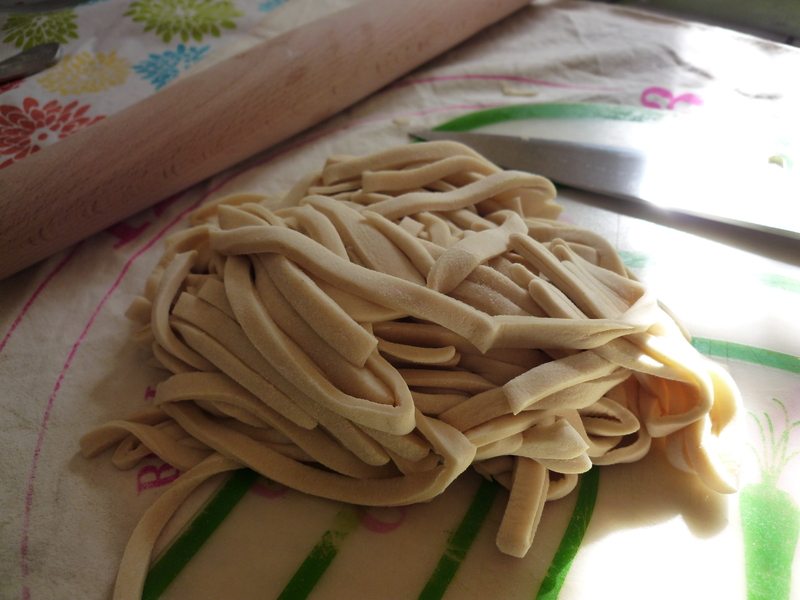 If you cook a big batch of noodles at once, they’ll start to stick together before you can dish it all up. 2) The frozen noodles are better than the dried ones. They stay chewier and are less likely to stick together into a horrifying ball of mush. Noodles can end up looking like those record-breaking rubber band balls, but worse, because the noodles are all gray. 3) Hamhung-style sweet potato noodles are slightly softer, less macho tough in flavor than Pyongyang-style buckwheat noodles. I prefer Pyongyang-style, but it’s all a matter of taste. You’ll see it written on the package, that is if you read Korean. Or you can copy these characters: 함응, or Hamhung; 평양 or Pyongyang; and 칡 or chik, if you want to eat the chewiest of the chewy, black noodles made of arrowroot. 4) The easiest way to keep noodles chewy is not to boil them, the way most packages instruct you to. Instead, place the noodles in a large, broad bowl and pour in boiling water to cover. Let it sit for 20 -30 seconds if frozen, 2-3 minutes if dried, and then rinse furiously under cold running water. They’ll soften sufficiently while still being chewy. This will not work though, if your bowl is full of enough noodles to feed ten people. See Lesson #1. Lessons learned. I hope I get back into my groove soon. This is how my sister feels about mul naengmyon, the Korean dish of chewy buckwheat noodles in a very clear, very fine cold beef broth. She feels pretty strongly about bibim naengmyon, too, which are the same noodles also served cold, but in a sweet, spicy red pepper sauce, rather than the beef broth. I’ve never shared Mona’s passion for naengmyon. There’s nothing like a cool bowl of naengmyon on a hot summer day, but there is also so much mediocre naengmyon out there, I had forgotten how good it could it be. 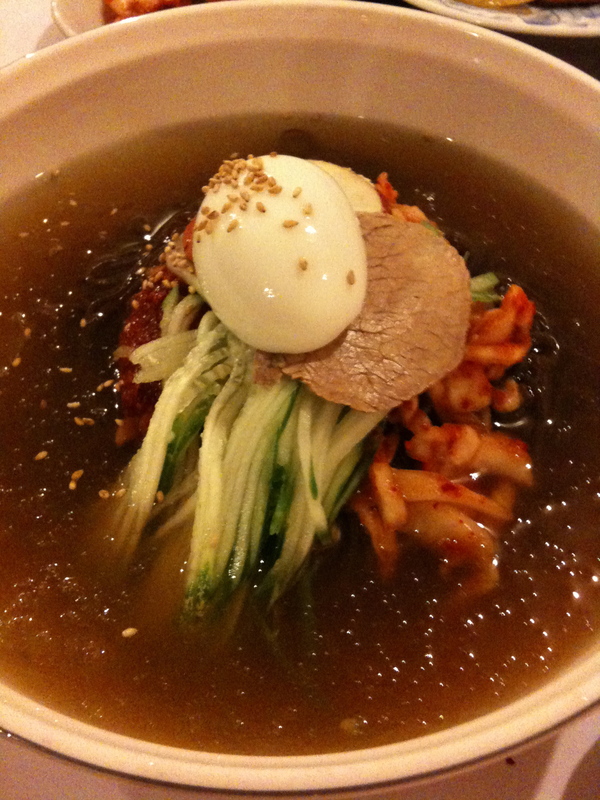 But yesterday, having lunch at Hanwoori, I had a naengmyon epiphany. 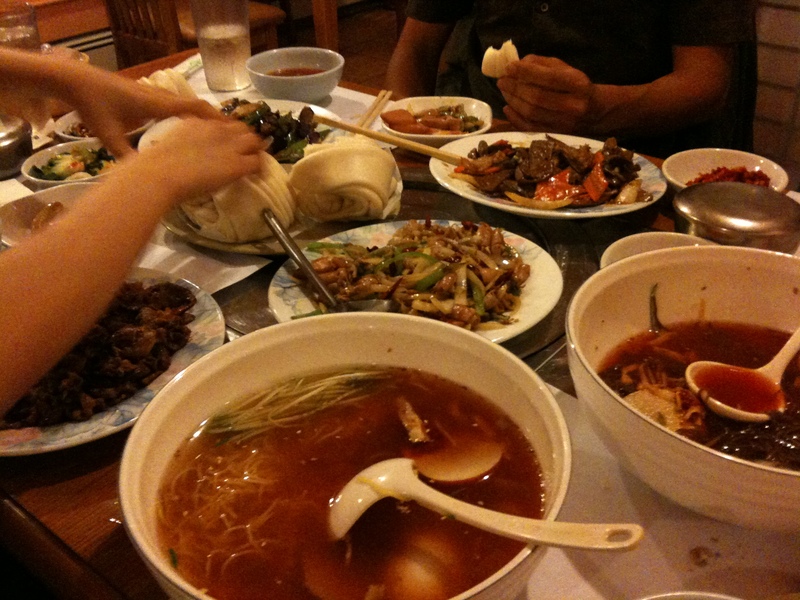 It is one of “The Top Five Noodle Dishes of Asia”. It was easy to forget because unlike some of the other contenders, naengmyon is a difficult food. Nine times out of ten, a bowl of pho or ramen will be perfectly tasty, if not sublime. Naengmyon, on the other hand, will be utterly forgettable nine times out of ten. The tenth time, it will be sublime. 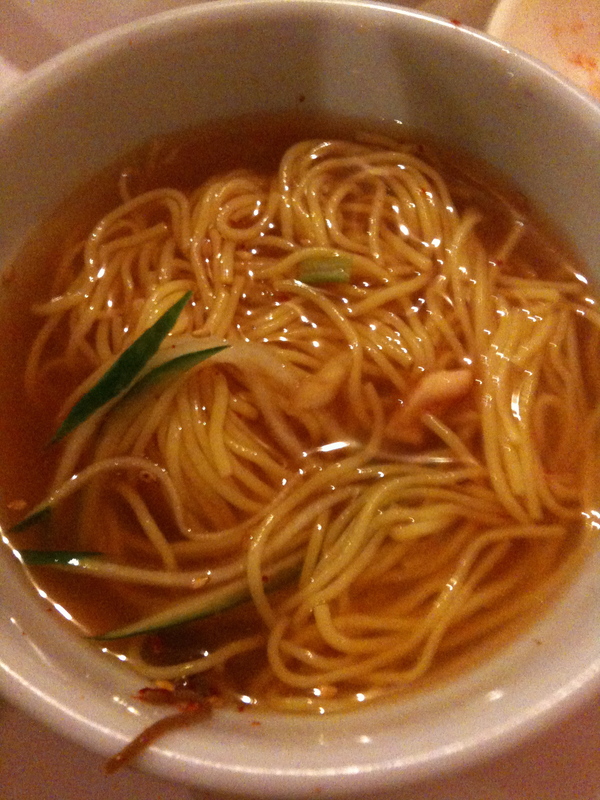 The biggest challenge with mul naengmyon is the broth. If the idea of a cold meat broth turns you off, there’s a reason. It has to be carefully clarified, skimmed of all fat, rich in flavor and yet still clear and light, without the heavy gelatinous mouth-feel of most meaty stocks. The broth and the noodles are the main players, so they must not be overwhelmed with garnishes, but a few thin slices of pickled cucumber and radish, sweet Asian pear, cold sliced beef, and half a “pretty boiled egg” add just the right amount of contrast in texture, crunch, and flavor. Even if a perfect bowl comes out of the kitchen, you the eater have to be careful with the last-minute condiments of a spicy mustard and vinegar. The perfect proportion will make the broth sing; too much of either will muddy the broth and no amount of adding the other will ever restore the balance. Bibim naengmyon is not much easier. There’s no cold beef broth to deal with, but the sweet, spicy sauce is surprisingly hard to get right. I’ve had so many bowls of bibim naengmyon that were too spicy, too sweet, or too much of both, as if the cook hoped to simply overwhelm my tastebuds to hide his lack of skill. At Hanwoori, only a small amount to just coat the noodles was sufficient to make the noodles perfect. It was just spicy, sweet, and tart enough to tease you into wanting more. 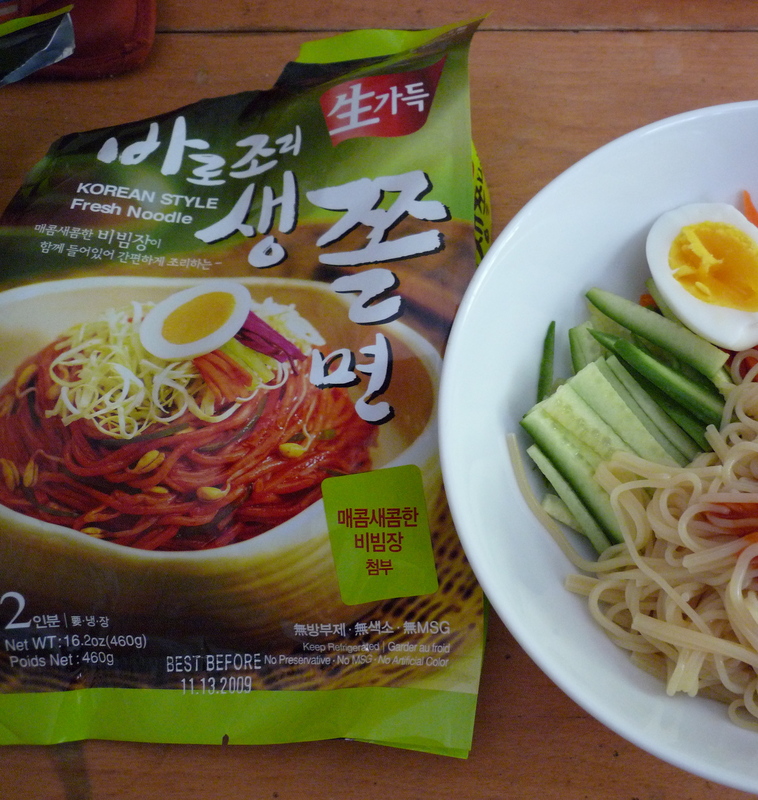 Naengmyon is a culinary lodestar. It reminds me that the best food is made with balance, restraint, and care. The best food can’t be eaten everyday or wherever you want—there is no good naengmyon in Manhattan. Most of the time, I will still choose what is more easily satisfying—like ramen during a layover at the Tokyo airport—because warm satisfaction is good for the soul. But it’s equally good for the soul to occasionally eat and know there are foods like Hanwoori naengmyon out there.